Tucked beneath the Thames Link Bridge in central London lies one of the most intriguing food markets I have ever had the chance to visit. This place, caught between the modern world and what I imagine a medieval London would have once looked like (although much, much cleaner) has, in many ways, captured everything I love about food. It is a culinary oasis in the heart of the city that continually draws me back. If you haven’t guessed, I’m talking about Borough Market. I was first introduced to Borough Market by a friend who took me there to cure our jet lag with some good eats. Walking the small, winding paths that guided us from stall to stall, I was overcome by the variety of beautiful smelling food on offer. Pork sandwiches, vegetable curries, pad Thais, Spanish paellas, freshly baked breads and, of course, mountains of warm pastries. There was something to make your mouth water at every turn. Now, most people who have been to Borough understand that making a decision about what to eat isn’t always an easy task. And they’re not exaggerating. I could literally spend a week there and not have the same food twice; that was my experience on this most recent visit to London. Waking up early to battle the morning commute to London Bridge was a necessary evil, given what awaited me at Borough. Wandering around as the merchants set up for the midday rush revealed why this market feels so different to the many I’ve encountered on my travels. Mixed in with the sounds of whistling coffee machines and the smells of aromatic spices was a deep appreciation of and respect for food and tradition. There isn’t a rush to set up stalls. Instead, there is a sense of thoughtfulness and purpose in the ritual. 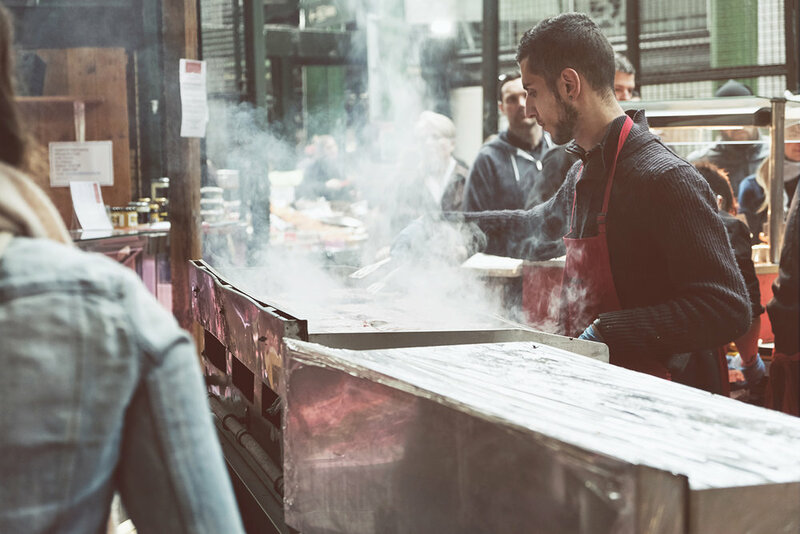 It was these instances, during my mornings at Borough, that made me recognize how much this London market valued the food they offered and how this, in turn, helped to create the energy and atmosphere that makes it unique. Come lunchtime, the market’s energy changes from quiet reverence to organised chaos. As I made my way through the crowd of people pondering what to enjoy, freshly cooked delicacies enticed me from one stall to the next. This game of culinary tiki-taka quickly overwhelmed my senses, before I realised that I too could not decide what I wanted to eat. 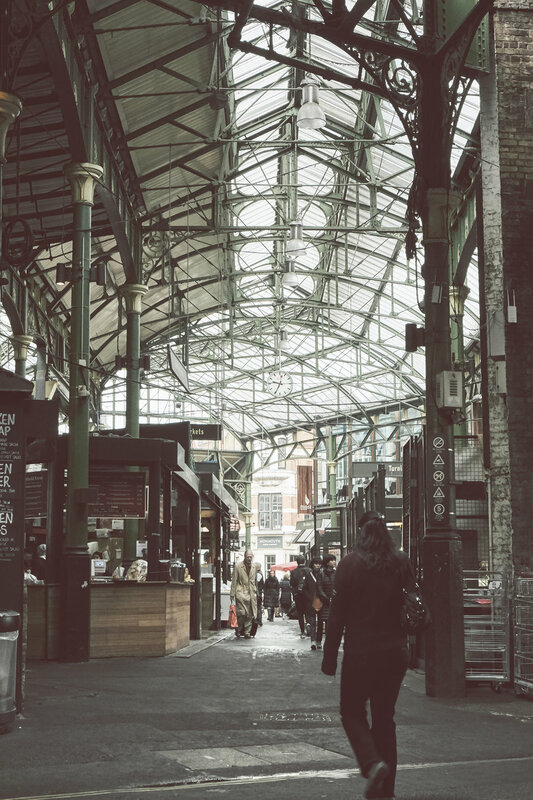 When you get a chance to sit back and take in the Borough Market atmosphere you’ll be taken with the buzz, friendliness and foodie adoration. There is something about this place that makes people slow down and enjoy the time they spend eating; something that isn’t very common in a large metropolis. Most importantly, it is in places like this that one can witness the true power of food - where issues are set aside and a sense of community is created through a collective need. That is where Borough Market has found its strength, by bringing people together through food and a passion for doing it right. Images Copyright @ Sébastien Dubois-Didcock. All rights reserved.